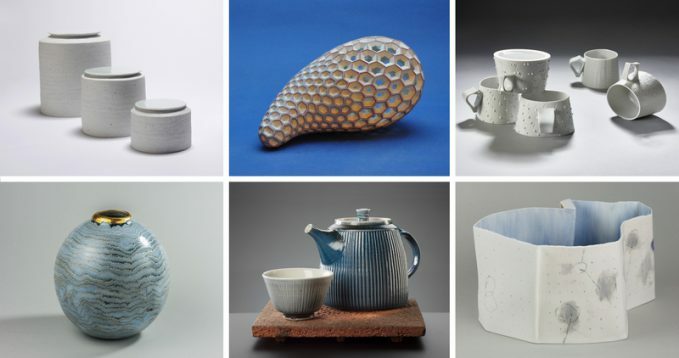 Our next exhibition, which runs from 7 April to 25 May 2019, will show the work of six ceramists. They are: Kiho Kang, Susanne Lukacs-Ringel, Nela Havlicková, Stéphanie Bertholon, Beatrijs van Rheeden and Yuk Kan Yeung. Three of them exhibit for the first time in our gallery: Stéphanie Bertholon, Beatrijs van Rheeden and Nela Havlicková. We met them at the Keramik Tage in Oldenburg, an important ceramics market in Germany that we visited in 2016, 2017 and 2018 and made these contacts. 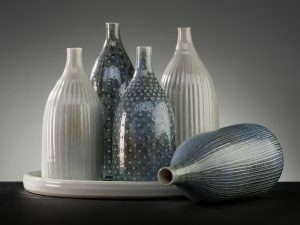 Stephanie Bertholon (Paris) initially opted for a career as a glass artist, by chance she came into contact with porcelain at the Ecole de Céramique in Aubagne. This was her material, first the pure white turned into extremely fine objects, then she immersed herself in the application of glazes, one over the other.Stéphanie finds her inspiration mainly in the animal world, in the patterns of their fur, in the colors of peacock feathers, the dots of butterfly wings or fish scales. She applies this to simple shapes, bowls, (cylinder) vases and boxes. An important role in the decoration process is the gold luster that she uses as magical, finishing touch, it brings living light into her work. 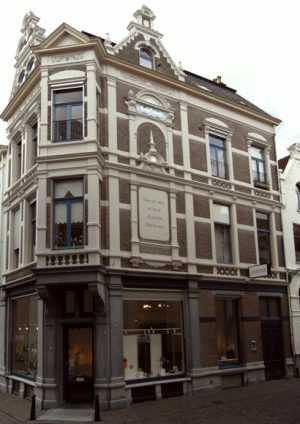 Beatrijs van Rheeden (1965 Groningen) attended the teacher training at the Minerva Academy in Groningen, after which she studied ceramics at the Constantijn Huygens Academy in Kampen. 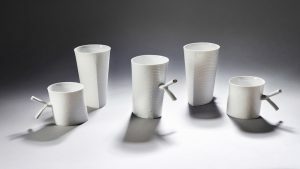 Porcelain became her favorite material, the possibilities of which she investigated during several work periods in Kecskemet in Hungary. Her free work involves open structures and rhythmic repetitions. After having developed this work for a number of years with the ultimate form of a dome-shaped multiple consisting of stackable tripods, she was ready for a new challenge around 2012. Inspired by the work of Kap Sung Hwan, thick-walled porcelain with color inclusions, and Marc Leuthold, who specialized in cutting leather hard porcelain, she sets new ground. 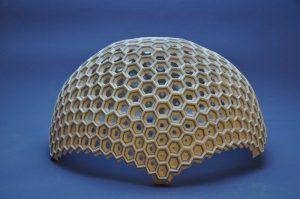 The result were organic forms built up freely of thick-walled porcelain, sometimes with color sometimes entirely blank and provided with a pattern of triangular, star-shaped or hexagonal rhythmic incisions. With this work she won in 2017 the price of the magazine New Ceramics / Neue Keramik during the Keramik Tage of Oldenburg. Nela Havlicková (Czech Republic, 1988 Marienbad) is also participating for the first time in an exhibition in our gallery. Yet she is no stranger to us, we met her at the ceramics market in Oldenburg in 2016 and have kept her work in stock ever since.Nela studied ceramics and specialized in porcelain at the art academy in Karlsbad early on, followed by a study in porcelain design at the Faculty of Art and Design at Usti nad Labem. 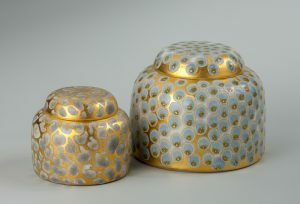 In Halle / Saale she then obtained the Master of Art title in porcelain design at the University of Burg Giebichenstein. Her work, very fine molded series, consists of bowls, bowls, boxes, vases, etc. All work has subtle surface structures and reliefs or transparent glaze patterns such as in Chinese porcelain. She carries her own brand “Nela Porzellan”. Yuk Kan Yeung (HongKong 1959) exhibited in our gallery for the first time in 2003, then in 2006 (“Voyage”), 2009 (“Journal”), 2012 and 2014. She got her education at the Chinese University in Hong Kong where she graduated in visual arts in 1989.She then studied ceramics in London at Goldsmiths College. There she met her later husband Antonius Nijssen with whom she came to the Netherlands in 1987. Yuk Kan Yeung’s work in porcelain is entirely hand-built from thin slabs of porcelain clay with which she creates individually designed fragile containers. On the surfaces of this, subtle poetic drawings appear in which emotion and memories play a role influenced by poetry and literature. Yuk Kan Yeung likes to work in thematic series such as the aforementioned Voyage and Journal. Kiho Kang (Korea 1980), got his education at the Kookmin University and came to Germany with a scholarship to become more proficient. He came to the Fachhochschule under the mentorship of Fritz Rossmann who was a teacher there. Kiho Kang felt well in Germany, he acquired one prestigious award after another, now he has settled in the region, in the town of Bad-Ems. He exhibited his work earlier in our gallery in 2016 during the vase exhibition and in 2017 in the group exhibition Ceramics from Höhr-Grenzhausen. 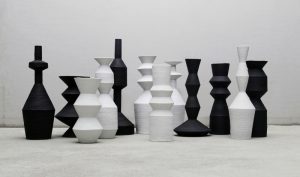 Characteristic of the work of Kiho Kang is the porcelain mass which he prepared himself and with which he coils up his work extremely slowly.It are sober, constructivist looking geometric vessels, strong in shape and glazed only on the inside. Basically functional but very aesthetic in the execution due to the interaction between shape and surface.In addition, the relationship between the forms plays together, he likes to present his work in a group of still-life-like compositions. 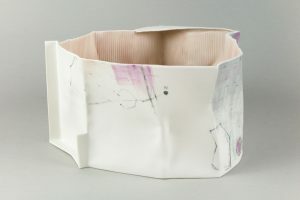 The previously exhibited work was done in sober gray-white porcelain with traces of iron. Later there was color in the work (yellow) and on this exhibition his work was done in black and white (see photo). Susanne Lukacs-Ringel (Germany 1963 in Bietigheim-Bissingen) also took part in the vase exhibition in 2016. She likes to experiment with porcelain in the anagama wood kiln, in addition to the production of tableware made from series. The actual work also comes from the wood-fired kiln but is also partly provided with a subtle cobalt blue slip and using salt glaze. Susanne was educated largely in the practice of fellow potters in Germany, she did workshops with ceramists in Germany, England and Japan. In her own words: “My way of working is based on traditional craftsmanship in pottery in Germany. I produce pots to use everyday. In my work, there is an important influence from the world, special from Korea, China and Japan. To fire with wood means much to me, to be in the whole process of the 4 elements, earth, water, wind and fire. I want to produce fine tableware and tea ceramics, which will be a lively character to the person who will use it and brings strength and calmness. My inspiration comes from the nature around the place I work, and I give all my human being into it “. Information on the exhibited work you will find on the Dutch page for this exhibition.